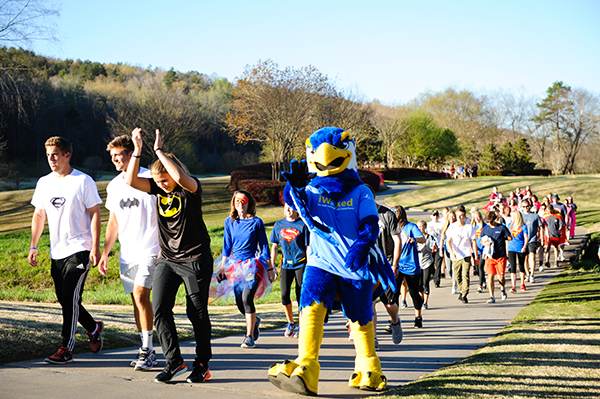 Nigel the Nighthawk walks with students, faculty, staff and community members during the inaugural Run with Superheroes in 2016. The University of North Georgia (UNG) will hold its second annual Nigel the Nighthawk's Run with Superheroes on March 27 to benefit UNG Athletics' Make-A-Wish initiative. The family-friendly race/walk will include entertainment for all ages, including live music, face painting, ice cream, and activities during the Winners' Festival following the race. "Our student-athletes continue to work hard to support the Make-A-Wish initiative, and this event is a great way for the campus community to get directly involved in helping to make children's wishes come true," said Lindsay Reeves, director of athletics at UNG. "Whether you want to run, walk, enjoy the festivities, or simply dress up as your favorite superhero, we hope you will come join us for what is becoming one of our most anticipated and celebrated events." Participants are encouraged to attend in costume; awards will be given for Best Individual Costume and Best Team Costume. The judges' panel will comprise Make-A-Wish children from the local area. There will be a special grouping for racers and the event will be timed, though there will not be competitive awards for top finishers. The event costs $25 per person, or $20 per person on teams of 10 or more. The event will be held on UNG's Dahlonega Campus at 6 p.m., and will begin next to the promenade across from Memorial Hall Gymnasium. To register, visit: http://ungathletics.com/sports/2016/1/7/MAW_Walk.aspx. The run marks the culmination of UNG Athletics' 2016-17 Make-A-Wish fundraising campaign. Since 2010, UNG has raised more than $107,000 for Make-A-Wish, having raised at least $10,000 in every year since 2010-11 — more than 10 wishes have been granted from the university's efforts. 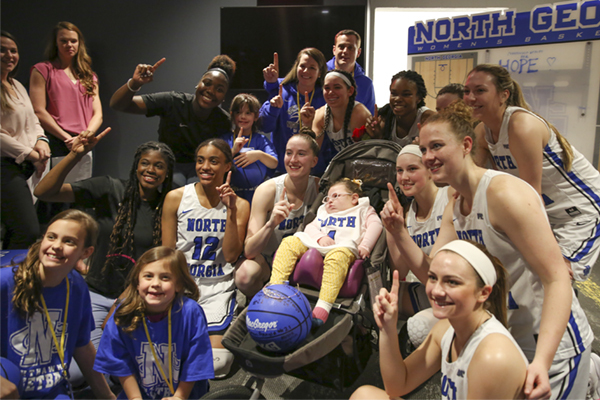 UNG has also won the Peach Belt Conference's Make-A-Wish Award, named after former UNG student-athlete LeeAnn Noble, for five consecutive years. UNG raised more money for the Make-A-Wish Foundation in 2015-16 than any other NCAA Division II school, marking the fourth time the university has led the division. 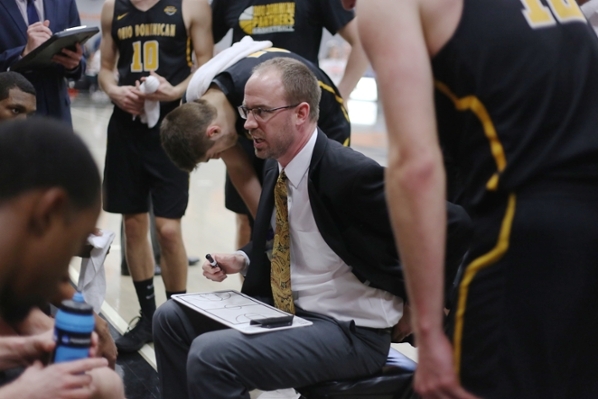 The university set a new record with $34,000 raised, beating its own high mark of $21,413 in 2013-14 and setting a new record for the highest single-season donation by an NCAA Division II school.